Guts Casino is still quite a young and fresh online casino for New Zealand players who love to play the best pokies available online. The casino was launched in 2013 and has quickly become one of the most talked about and popular online pokie destinations accepting players from New Zealand and offering play and banking in NZD. The brand uses a wide variety of the industry’s best software providers to produce an online gaming platform with exceptional diversity and high quality, cutting edge casino gaming. As with many of the newer generation online casinos, the casino is available entirely as a Flash-based platform, allowing quick and easy casino gaming regardless of pc operating system. Further complimenting this technology is a full mobile platform that can be accessed with any HTML-equipped mobile device. This diversity allows Guts players to access the best of all the top brands including Microgaming’s top progressive jackpot pokies and NetEnt’s hottest 3D animated 5 reel video slots. Some of the games you can expect to play hundreds of slots including 3 reel and 5 reel 3D and video and no less than 12 progressive jackpot pokies. Kiwis can also enjoy a respectable collection of classic casino games including Roulette, Blackjack, Baccarat, Video Poker, Bingo, Scratch cards, Craps and a number of other games. Fans of the live casino experience can also enjoy Live dealer versions of Roulette, Blackjack, Baccarat and Poker. Guts Casino offer a fairly unique sign up package that uses a number of bonus codes that new players need to tick before any bonus is awarded to their accounts. This allows players to pick and choose which bonus offers they want and which ones that prefer to skip. The casino also adds free spins with each of the bonus offers, making for a diverse offer that covers basically everything that the casino has to offer game-wise. 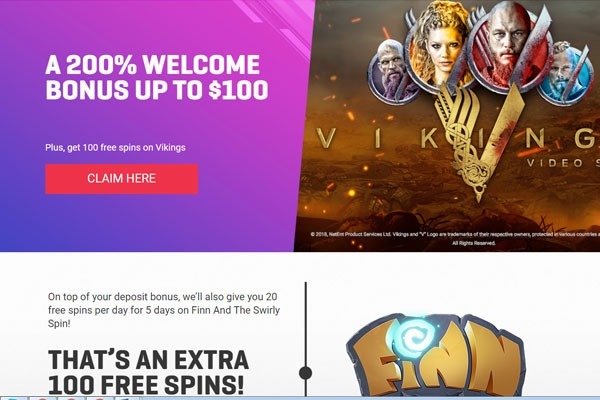 The first 100 free spins and on offer are exclusively for play on the Vikings slot game the additional 100 spins can be play on Finn and Swirly spin slot games, all free spins are completely wager free from and a minimum deposit of $10 is required in order to qualify for any of the bonus offers. You will get the free spins at a clip of 20 per day over the course of 5 days. Once any of the bonus offers have been accepted and deposited into your account, a minimum wagering requirement of 30x the bonus plus deposit amount is required before funds can be released for withdrawal. Deposits with Paysafecard, Skrill and Neteller cannot be used to get the Welcome Bonus. Bonus quality – our thoughts: Guts Casino are quite innovative in every aspect of their casino. 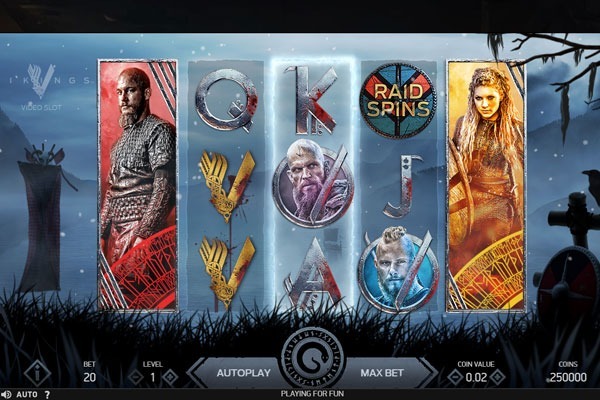 The deposit bonus is fairly modest at $100 but it is matched at 200% and the added no wager free spins is huge and, if you haven’t played Vikings before, is a great way to get to know this fun slot. Play through requirements on the bonus money is quite steep so it’s a good idea to be aware of this before making your final choice. Kiwi fans of mobile pokies will be delighted to know that Guts Casino offers one of the most comprehensive collections of mobile pokies in the industry, with over 100 to choose from. This is more than any other online casino at the moment and it makes taking your favourite pokie with you wherever you go super easy and fun. To make it even better, the Guts casino mobile casino platform can be accessed via any mobile smartphone or tablet device that uses HTML5 browser technology. All you need to do is log into your Guts casino player account from your mobile browser to access your account information, banking options, bonus offers and promotions and of course, 100 of the best mobile pokies in the world! 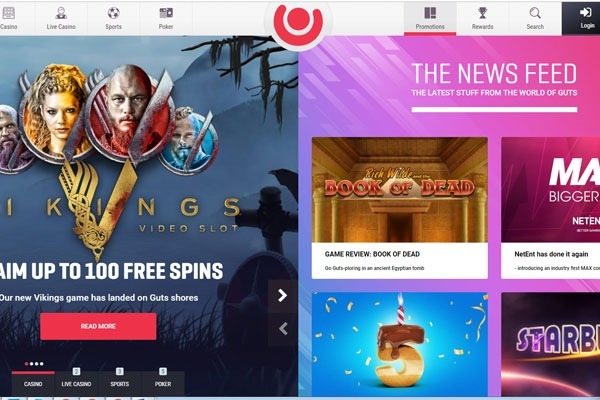 Guts Casino run a variety of new or ongoing promotions and it is recommended to sign up for their casino newsletter to keep up with whatever is happening at the casino with daily, weekly or monthly promotions. The casino comes up with some interesting promos such as the Free Spins Friday promo where players can win additional free spins based on the amount that they deposit the day before. Currently the casino does not offer a VIP program or loyalty rewards program but we believe that this is in the pipeline so keep an eye on your mail. Guts Casino provides plenty of options for New Zealand players to make deposits and also withdraw their winnings in NZD. This casino is well-known for their fast withdrawal times with some players reporting payouts in less than 24 hours and most in less than two hours with no additional charges to their accounts. Popular banking options at Guts Casino include: Visa, Visa Electron, MasterCard, Maestro, PaySafeCard, Neteller, Skrill, WebMoney and Trustly. Guts Casino may have a slightly odd name but it is probably quite appropriate since this casino brand is really trying to push the boat out and do things a bit differently. The casino offers some of the fastest payout times that we have ever seen with many players reporting payouts in less than two hours! The casino also offers a diverse gaming selection courtesy of several of the very best software providers in the business as well as a sportsbook, live casino and mobile, all accessible from a single account!